This week we celebrate Veterans Day which is the official holiday in the United State designated to honor those who have served in the U.S. Armed Forces who are also known as veterans. Observed on November 11th, it is a observed as a federal holiday. This day was originally celebrated as Armistice Day which marked the anniversary of the end of World War I. In 1954, Armistice Day evolved into Veterans Day and, to this day, continues to be a holiday to remember our veterans of all wars. The United States Department of Veterans Affairs is a government run military veteran benefit system. 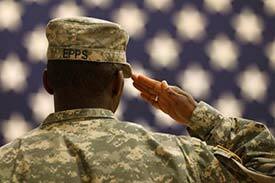 Its primary purpose is to support all veterans of all wars after their service. The VA provides benefits and support for all Veterans. One of those benefits is the VA home loan. Through the VA home loan, the VA provides assistance to servicemembers, veterans and eligible surviving spouse who wish to become homeowners. The VA’s mission is to serve veterans and continues to do so by providing a home loan guaranty benefit, along with other housing related programs. These programs help veterans purchase or build homes, make repairs or retain their existing home. Private lenders, such as banks, offer VA home loans to eligible veterans. However, the VA guarantees a portion of the loan which enables the lender to offer more favorable terms to the veteran who is making a home purchase or already owns a home. With a VA loan, a veteran can purchase a home with no down payment and no monthly mortgage insurance. Along with 100% financing for a home purchase, the VA home loan program comes with many additional benefits, all designed to make homeownership easier for veterans. It is our mission here at Veteran Home Financing to serve all veterans every day of the year by offering competitive VA loans. Helping veterans attain homeownership is our speciality and our way to pay back those who have served our country. As an approved nationwide lender for VA loans, we provide the ease of speaking with us without the need to physically visit an office. This Veterans Day and throughout the year let us all remember and honor all American veterans for their courage and patriotism along with their willingness to sacrifice and serve for our freedom.